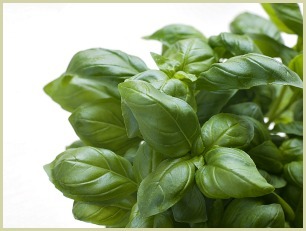 Growing Basil Herb For the Healthiest, Freshest Tastiest Leaves! Growing basil is highly recommended. This tasty herb is a favourite in kitchens worldwide. And growing it yourself ensures a constant supply of the freshest, tastiest leaves. There are many varieties to choose from; lemon, Thai, purple, cinnamon and sweet basil to name just a few that you could consider growing. Read more about the sweet variety. Suitable for the novice herb gardener, basil plants do best in a sheltered sunny position in rich, well draining soil. Alternatively, it is just as at home in containers on a sunny patio or you can grow this herb in pots on a windowsill. Note: As it's an annual herb, you'll have to plant or sow fresh plants each year. About 1 month before planting out time, dig in some well rotted compost or manure into your herb bed. Sow the seeds in pots or plug trays using a general potting compost. I sow 4-5 seeds in 2 inch (6cm) pots. Once germinated, keep the soil moist. Try and water in the morning or midday, not in the evening. This herb doesn't like being cold and wet! You can sow seeds, grow seedlings or bought plants in rich, well draining soil in a sunny spot. After the last frost, thinly sow seeds in rows 12-16 inches (30-40cm) apart and a ¼ inch deep. When large enough to handle, thin out to 6-8 inches apart. It also thrives in pots on a sunny windowsill. The plants are prone to pythium wilt (damping off) if they get over crowded or too wet. To prevent this, sow seeds thinly in pots or plugs. Keep the soil moist and water around midday, don't over water. Keep an eye out for slugs. If you get whitefly or greenfly, treat with a horticultural soap solution. After about 8-10 weeks it should be ready for you to harvest a few leaves. It's best to pick young leaves from the top of the plant as this will encourage new growth. And better to have several plants so you don't over pick one. Note: You can use the leaves to make a healthy drink. Click here for my recipe. Early spring: Sow seeds indoors. Spring: After last frost, plant cuttings, young plants or seedlings into herb bed or containers. Summer: Pinch out the tips of the plants to prevent flowering and to encourage new growth. Autumn: If you have let them flower, harvest the seeds. Late Autumn: Bring pots inside so you have leaves to pick through winter. Winter: Dig compost/manure into next years bed. Return to the main Growing Herbs page.